Bromo Sunset Tour Package – Want to go to Bromo but are lazy to wake up in the morning to pick up the sunrise with a very cold temperature on Mount Bromo? 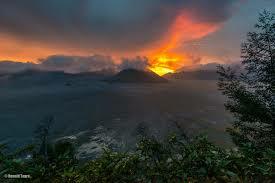 You can choose another alternative which is to see the sunset on Mount Bromo. Who said that at Bromo only the best sunrise try to prove the beauty of sunset on Mount Bromo from the highest peak of Mount Penanjakan. The afternoon atmosphere at Mount Bromo is perfect for those of you who want to find a new panorama on Mount Bromo that is romantic with a partner while on vacation. Bromo Tour Package (Sunset In Bromo) It is almost the same as other Bromo tour package , except for the tour to Mount Bromo midnight and 2 days 1 night in general starting in the morning before dawn while for Bromo Sunsite you do not need to come at midnight to capture the moment the beauty around Mount Bromo is enough to start the journey by pick up from Surabaya or Malang at 8 in the morning. By choosing a sunsite package you can enjoy your vacation calmly because it is not as busy as when taking a sunrise bromo package and can still visit all of Mount Bromo and surrounding attractions such as Pasir Berbisik, Teletubbies Hill, and Bromo Crater but with a different atmosphere. By joining the Bromo Sunset tour package you don’t need to be afraid of the coldness of Mount Bromo because the temperature there has started to warm up during the daytime when you join the Bromo Sunrise tour package. Here’s the bromo sunset tour package rundown (itinerary). 08.00 – 09.00: Pick up at the participant’s place / address. (Malang City / Batu & Surabaya City area). 09:00 – 11:00: Travel to Transit Point for Over Jeep. 11.00 – 12.00: Travel to Padang Savana (Teletubbies Hill) and Whispering Sand. 12.00 – 14.00: Padang Savana & Whispering Sand. 14.00 – 16.00: Bromo Crater and Luhur Poten Temple. 16.00 – 16:30: Travel to Bukit Cinta. 16.30 – 18.00: Enjoy the beautiful Sunset at Bukit Cinta. 18:00 – 19:00: Travel back to Transit Point. 19:00 – 22:00: Travel back to Malang / Surabaya (Drop to Address of Each Destination). For more complete and valid pricing, please contact our online service (https://surabayabromotour.com) because the price of the Bromo Sunset package is adjusted to the number of participants and the date of your tour plan. Shuttle Transportation Area Malang City, Batu Kota & Surabaya Kota. Professional drivers are polite and friendly. Entrance tickets for all locations in Bromo. Rent a Horse in Bromo. Prepare and Use comfortable clothes (Bring a warm shirt / jacket). Also prepare socks, gloves and headgear. Don’t forget the Camera and Power Bank.